Greenfire used the Living Building Challenge as its roadmap. What if every single act of design and construction made the world a better place? That is the test put forward by the Living Building Challenge and one of the guiding principles for Greenfire Campus. When 2020 Engineering first met with the project team to discuss Greenfire, we knew that the Living Building Challenge was going to be our roadmap. Comprised of seven performance areas  site, water, energy, health, materials, equity and beauty  the building challenge paralleled the conservation and ecological goals of Greenfire. Like the sustainability goals of Greenfire, the Living Building Challenge is a cohesive “deep green” building standard, pulling together the most progressive thinking from the worlds of architecture, engineering, planning, landscape design and policy. It challenges us to ask the question: What if every intervention resulted in greater biodiversity, increased soil health, added outlets for beauty and personal expression, realigned food and transportation systems, and a deeper understanding of climate, culture and place? Greenfire touches on each of the seven performance areas. 2020’s role in creating a deep green building focused on two primary areas: sustainable water design and urban agriculture. Almost half of the land at Greenfire is dedicated as urban agriculture and garden areas. To meet this challenge, the project team used sustainable water design principles developed by 2020 Engineering in 2009 to select site features that were incorporated into the final design. These guiding principles provided a mind-set for the owner and design team that led to simple, yet elegant solutions that get to the heart of sustainable building goals. 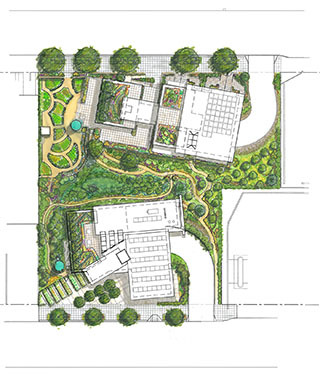 This included options that mimic natural systems (striving for net zero impervious surfaces design), create permeable surfaces (green roofs, walkways), use impervious surfaces for beneficial uses (rainwater harvesting, roof gardens), and use landscape areas for stormwater management (compost-amended soils, bioswales, constructed wetlands). The resulting design demonstrates the integration of civil engineering stormwater management with landscape architecture to provide a site that meets development regulations within a beautiful nature-based environment. The innovative stormwater management approach strives to create a built condition that mimics nature through the use of features that maintain or restore a site’s natural hydrologic conditions, achieving an effective net zero amount of impervious surfaces. The Earth, just like all forms of life, needs to be able to breathe and take in water in order to maintain or restore its health. Stormwater is rainwater and melted snow that runs off streets, lawns, farms, and construction and industrial sites. Under natural conditions, stormwater is absorbed into the ground, where it’s filtered and ultimately replenishes aquifers or slowly flows through forests and meadows and into streams and rivers. In developed areas, however, impervious surfaces such as paved streets, parking lots and building rooftops prevent precipitation from naturally soaking into the ground. Instead, the water runs rapidly into storm drains, sewer systems and drainage ditches. A rush of stormwater can cause downstream flooding and erode stream banks. As the ensuing runoff flows over the land or impervious surfaces, it accumulates debris, chemicals, sediment, bacteria or other pollutants that adversely affect water quality and contaminate watersheds and coastal waters. More than a decade ago, an alternative approach for the management of stormwater was conceived and developed. This concept was named low-impact development, or LID. LID combines resource conservation and a hydrologically functional site design to reduce development impacts to better replicate natural watershed hydrology and water quality. Through a variety of small-scale site design techniques and impervious surface reduction strategies, LID controls runoff discharge, volume, frequency and the ability to mimic natural, pre-development conditions. The unique LID micro-management source-control concept is quite different from conventional end-of-the-pipe treatment and detention methods typically used for stormwater control. Greenfire was able to implement low-impact strategies to meet its building permit requirements since the city of Seattle has also taken the LID methods to create its own Green Stormwater Infrastructure and RainWise Solutions programs (information about both at http://www.seattle.gov). Examples of green stormwater infrastructure strategies include trees, raingardens, permeable pavement, green roofs and rainwater harvesting. Taking the proven concepts of LID and combining them with other sustainable building practices leads to other opportunities that are simple, environmentally friendly and cost-effective. Almost half of the land at Greenfire is dedicated as urban agriculture and garden areas. An estimated 70,000 gallons of rainwater collected throughout the year will provide all of the irrigation water needed for the urban agriculture areas. Each of the two buildings has its own rainwater harvesting system. The rainwater runoff is conveyed into a 14,700-gallon cistern for the residential building and a 17,700-gallon cistern for the office and restaurant building. The size of each cistern was based on typical monthly rainfall amounts and estimated irrigation demands for the drier summertime growing months. The rainwater systems include a few screens and filters to adequately clean the rainwater prior to being pumped for irrigation uses. The project’s design goal for using rainwater is to be 100 percent self-sufficient for all on-site irrigation needs. The chlorine-free rainwater will also help to provide healthy organic vegetables and fruits. From an engineering perspective, urban agriculture reduces harmful runoff, increases shading, and counters the unpleasant heat-island effect. From a conservation perspective, growing what we need where we live increases food security and decreases the environmental costs associated with long-distance transportation. From a human perspective, urban farming not only greens our cities but helps people reconnect with the Earth, and gain a greater appreciation for where our food comes from. What if every single act of design and construction made the world a better place? Welcome to Greenfire Campus. Mark Buehrer is director of 2020 Engineering. The firm provides sustainable civil engineering focusing on water conservation and low-impact site features that include integrated designs of rainwater harvesting and urban agriculture with cisterns, green roofs, living walls and vegetable garden plots. Are you ready for some urban farming?